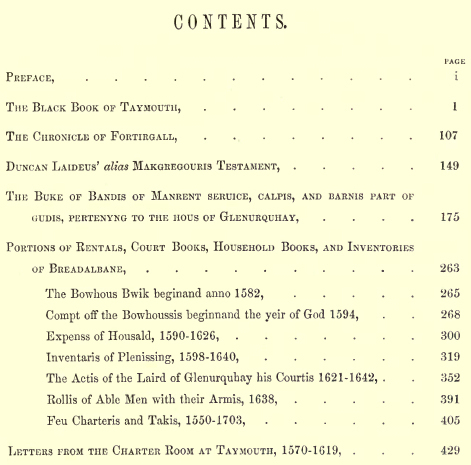 The materials of the present volume, all taken from the charter-room at Taymouth, have been selected more with the view of illustrating the antiquities of the Central Highlands, and the modes of life and thought of their inhabitants in the old time, than for any purpose of public national history, or for the genealogy and antiquities of the family of Breadalbane. But that family having so long borne sway in the district, their personal affairs are to some extent mixed up with all local history; and a general acquaintance with the early descents of House of Glenurchy is necessary for the full understanding of the materials now brought together first article. It is here brought together as the first article of our collection. The "Black Book ok Taymouth," has been long known and used as an authority in the Highlands. 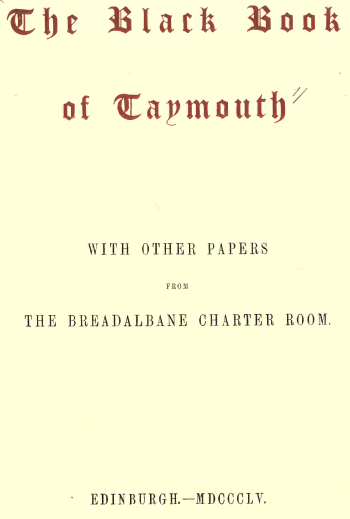 It is now for the first time printed from the MS. of its author, Master William Bowie, who seems to have discharged the double duty of family notary and pedagogue to the grandsons of Sir Duncan Campbell, the seventh laird of Glenurchy. He dedicates his work to his patron, in the month of June 1598, and though he lived to add some matter of subsequent date, the conclusion, coming down to 1648, seems written by a different hand. His chief object was to record the successive acquisitions of property.